PUNE: Akhilesh Khaire (12) could not figure out why it took him 70 minutes to cover 5 km, a distance he normally runs in 30 minutes. He struggled to finish the race on Sunday morning, and did so with multiple cramps and a tired body. As he cast a dazed look about, fellow runners told him he had just run the 10 km route instead of the 5 km event he had registered for at the Pune International Marathon. Akhilesh was among a group of runners to run double the distance they were supposed to cover. "We were wrongly guided by the officials along the route. I asked many officials and volunteers about the 5km route and the 'U-turn', but they all guided me to go further. Instead of telling me to turn from the 2.5km mark, they sent me to the 5km mark and then make a turn for the finish line," a visibly fatigued Akhilesh said after he finished the race. His father, Ravindra, was tense. "I was so worried when he did not come back even after 45 minutes. I could see other participants come back, but there was no sign of Akhilesh. I thought he may have collapsed along the route and was about to look for him when I saw him make it to the finish line," he told pune-news.com. "I am aghast at the way Pune International Marathon is managed. There is nothing international about the event. There could have been a risk to my son's life as running for 10km is no mean task. I am so relieved to see him well," he added. When the father spoke to the officials at Sanas ground, they told him to send their complaint to the organizers' office at Marathon Bhavan. Uruli Kanchan resident Hitesh Malhotra also ran 10km though he had enrolled for the 5km race. He wanted his timing registered so that the certificate may help him during the army's recruitment drive. "Unofficially, I ran 10km and covered the distance in one hour, three minutes and 19 seconds. Officially, the timing has been registered against a 5km run. I am so ashamed of telling this timing to anybody, even my parents. Somebody looking at the certificate would be appalled to think that I took more than an hour to run 5km," Malhotra said. The certificate would actually be of a disservice to him, Malhotra said, as he has completed the 5km run in 21 minutes earlier. The 5km runners were charged a participation fee of Rs 885. Organising committee chief Prahlad Sawant was not reachable. Another organising committee member, Narendra Singh, said they did not receive any complaints. "As far as we know, everything went off smoothly," he added. 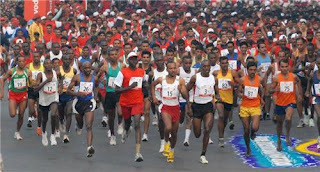 The Pune District Amateur Athletics Association organises the Pune marathon. It has landed in several controversies since the event was disaffiliated by the Athletics Federation of India.